Serving as the entry point into your home, your front door needs to be secure yet welcoming. The skilled team at Toms River Door & Window can help you find the perfect option among our wide selection of front doors. We are a family-owned company that has been in business for more than 47 years. Our long-standing success is thanks to our unwavering commitment to helping Jersey Shore homeowners enjoy the process of enhancing their homes. When you work with us, you can expect top-performing products, experienced installation technicians, and warm, friendly customer support. Our steel front doors simply can’t be beat in terms of durability and security. They are crafted from 20-gauge steel and offer heavy duty protection for your home. They will stand strong no matter what Mother Nature throws at them, and will maintain their like-new look for years. Our steel entry doors also feature special thermal barriers and foam-fills to prevent heat transfer and maximize energy efficiency. The fiberglass entry doors we install are among the most energy-efficient in the industry. They are heavily insulated and come equipped with a number of energy-saving features to keep outside air out of your home. This will make it easier for your HVAC system to heat and cool your home, which could lead to a decrease in your energy costs. 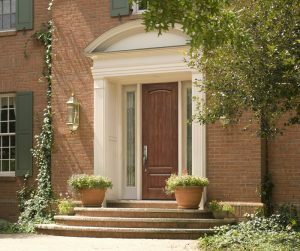 Our fiberglass front doors are also specially treated to resist denting, cracking, and warping, and will look like new for years to come. All of the front doors we install can be easily customized to complement your home’s design. We will measure your door opening with precision and then custom-make a door that fits perfectly. You’ll also be able to choose from an array of woodgrains, textures, stain and paint colors, hardware options, specialty glass designs, and more. We’re here to help in any way that we can and would be happy to provide a free consultation and estimate so that you can learn more about our front doors. Contact Toms River Door & Window today to schedule an appointment at your Jersey Shore home, or stop by our showroom located just off of the Garden State Parkway.